Now is the time to grab one of the brand new East Side pads before someone else swoops in and steals your view. Where else can you ditch the car and have entertainment, lakefront/river trails and daily services all within view of your apartment? There is an energy to the East Side that cannot be matched anywhere else in Milwaukee, and you'll find that living right in the middle of it will invigorate you. The new Greenwich Park apartments are completed and offer many attractive affordable living options in a great East Side location. The beautiful new building features affordable one, two and three bedroom apartment homes. Features and amenities include a fitness center, indoor bike storage, on-site laundry facility, W/D hookups in apartments, all utilities included, indoor parking, business center and on-site management. Visit https://www.mercyhousing.org/greenwichpark for more information. The Standard apartments are ready for move-in, and you'll be in good company as nearly half of the available units are occupied. The rooftop community terrace is a favorite already among residents. Visit the website for floor plans and prices. The East Library Branch celebrated its grand opening and beautiful new space in late November 2014. The library features a variety of work spaces and a front living room with fire place. An exciting conversion of the former Prospect Mall includes a striking new addition to the building: 52 high-end apartments with killer views. Visit the link for leasing specials, floor plans, and additional details. This brand new building is nearly completed and now leasing. 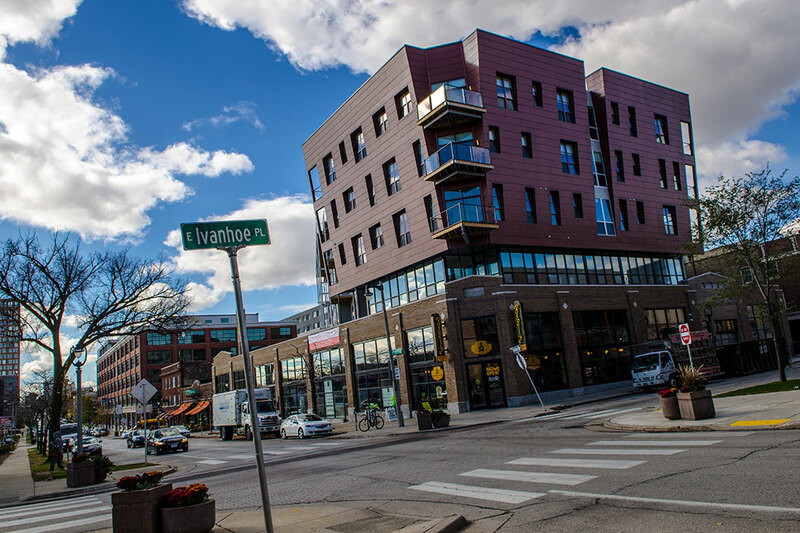 It offers 39 new apartments for those that want to live in the heart of The East Side but want a quick direct commute to downtown by bus or bike. The new first floor commercial spaces means residents above will be among the first to sample the latest businesses to open on North Ave.
Joseph Property Development built its aptly named ‘OaklandNorth’ on the site of the former Pizza Man building. The development offers one and two bedroom apartments featuring huge windows, balconies, custom kitchens, in unit laundry and secured parking if needed.